Clean away dirt and grime, fill in scratches, protect from water damage, and leave a shine that lasts! Perfect for floors with foot and pet traffic. BEFORE USING: Consult floor manufacturer’s instructions for proper care and maintenance. Test in an inconspicuous area and allow to dry 15 minutes before first use. 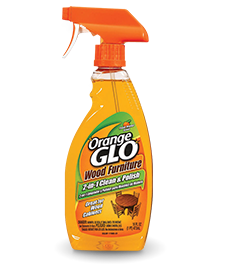 Orange Glo™ 4-in-1 Monthly Polish Hardwood Floor is designed for polyurethane sealed hardwood floors. This product should not be used on unsealed, laminate, and factory engineered or prefinished floors. Do not use on waxed, oiled or severely worn floors. Remove loose dirt from floor by dust mopping, sweeping or vacuuming. 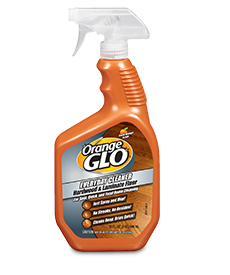 For very dirty floors, we recommend using an oil-free cleaner such as Orange Glo™ Everyday Cleaner prior to applying Orange Glo™ 4-in-1 Monthly Polish; ensure floor is completely clean and dry before proceeding. Squirt 4-in-1 Monthly Polish in an “s” pattern directly onto 4’ x 4’ area of floor. Immediately spread with clean, damp mop in long, even strokes following grain of wood. Move to next area and repeat. Rinse mop if it becomes soiled during application. Floor will dry to a brilliant shine in less than 15 minutes, although individual drying times may vary. Wait at least 12 hours for Orange Glo™ 4-in-1 Monthly Polish to dry before using any cleaner. PLEASE NOTE: Do not use more than once per month; overuse may lead to floor hazing. Do not walk on floor if surface is still wet or tacky. Do not apply any polyurethane coatings directly to floor that has been treated with Orange Glo™ 4-in-1 Monthly Polish. Thoroughly remove with a stripping product prior to using a refinisher. 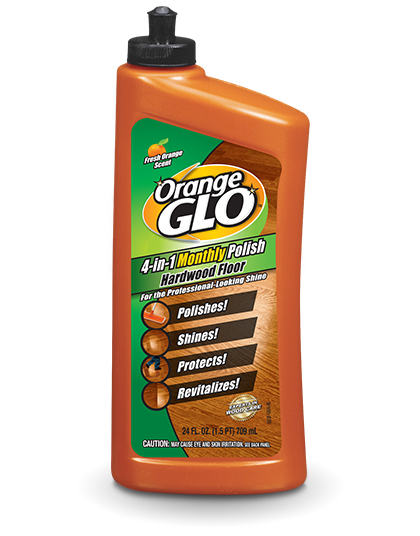 Orange Glo™ 4-in-1 Monthly Polish should be removed if there is buildup. If buildup occurs, or prior to refinishing, remove by mixing 1 cup ammonia in ½ gallon of warm water. Apply mixture, scrub, rinse with clean water and dry. CAUTION: May cause eye or skin irritation. If in eye or on skin, rinse thoroughly with water. If contact lenses present, remove lens and continue rinsing. See physician if irritation persists. If swallowed, drink a glass full of water and get medical attention. Contains solvents plasticizers and wax emulsions. How do I get my hardwood floors to shine again?